A structure of dichotomies now sits between Neville Scarfe and Sauder. This bendy, wavy-yet-solid wooden work — aptly named Wander Wood — is likely the most artistic and intentionally designed bench on campus. 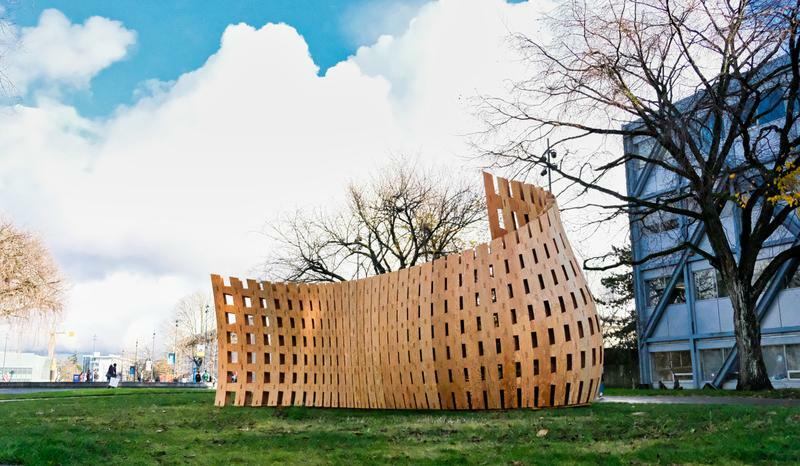 The creative efforts of students and faculty in UBC’s School of Architecture and Landscape Architecture (SALA), industry professionals and a swivelling robot were all required to assemble Wander Wood. Over a period of five days in October, UBC Associate Professor AnnaLisa Meyboom taught a workshop with Oliver David Krieg, director of technology at Lang Wilson Practice in Architecture Culture — a Vancouver-based design firm — and Assistant Professor David Correa from the University of Waterloo. Funding came from the province’s Forestry Innovation Investment, along with sponsorship from UBC Sustainability. The workshop was sold out and “highly sought-after,” said Jason Chui, managing director at the Centre for Advanced Wood Processing (CAWP) and an organiser for the event. There aren’t many design-and-build workshops like the one at UBC, which allowed participants hands-on experience with planning and executing a robotically fabricated structure in a span of five days. An undeniable draw for the workshop was, of course, learning how to work with the robot stationed in CAWP. Typical robots have six axes, but because the one at UBC sits on a horizontal tract, it adds one additional axis. Along with a table that turns, there are eight axes that it operates on. “Students really want to work with this particular robot because of the workable area and the size that we have with this machine. Technically the structure we could put up … could be up to 10 feet tall, 20 feet wide and 3 or 4 feet deep. It’s quite a machine that we’ve got here,” said Chui, speaking on behalf of his colleague Jörn Dettmer who is more heavily involved in running the robot. Having direct access to advanced design techniques and actually assembling something with the robot gives students a key understanding of the limitations and potentials of the system, said Meyboom. “You learn by doing a lot,” she said. Going into the workshop and in thinking about the design of Wander Wood, Meyboom wanted to experiment with the future language of digital fabrication with wood. Nowadays, architects are incorporating new software in their workflow, which changes the design process. “If you change how you design, then you change the language of the design and what comes out at the end,” said Meyboom. In the workshop, participants used software with a graphical interface to design the parts of Wander Wood. Since participants were either students in Meyboom’s nine-credit SALA course or industry professionals, they were already quite familiar with the software. What the workshop taught them was how to generate a text file in the language that the robot can read — essentially, participants learned how to give the machine instructions for how to build what was designed by humans. Wander Wood’s particular design was another aspect of experimentation as the workshop explored the balancing act between wood’s elasticity and rigidity. When wood comes out of the mill, it is usually a straight plank, called a member. Experts have found that they can use wood’s elastic bending range to shape it, as long as they have an understanding of how to work with unique variables like grain direction. Meyboom and her colleagues led students in learning how to harness the elastic properties of wood to make curved surfaces. “You need to have [the wood] be flexible enough to make the curved shape but stiff enough so it actually participates in the structure,” Meyboom said. Wood’s flexible ability to act as structure, finish and furniture, along with its sustainable aspects as a renewable resource, was highlighted by both Chui and Meyboom. Wander Wood, with its eye-catching curvature and seating area, showcases these properties perfectly. Research and experimentation will help answer this key question. For the experts who organised the workshop, bringing students into experimentation is a way of continuing to push the boundaries of digital fabrication. Plans are definitely in place for another workshop next year. Members of the UBC community and visitors can look forward to another public display like Wander Wood, which allows outsiders a direct opportunity to engage with the innovations in architecture on campus.